I have been continuing to work on my BirdZeed project for November, for which I’m quilting an illuminated letter. I drew out my design on Golden Threads quilting paper. This was the first time that I had used the paper and I’m sold. I used tracing paper before because I had it on hand and it was a complete pain to remove. The Golden Threads came off pretty easily, even with the tiny, tiny little sections I sewed. (I found that scratching at it like I was rubbing a scratch ticket worked well in those little spots, though my studio does need a serious vacuuming.) However, I used pencil to draw my design right on the paper and I don’t recommend that. Sketch on regular paper and then copy the final design with a permanent marker or something because the pencil lead seems to have really rubbed off on the thread. 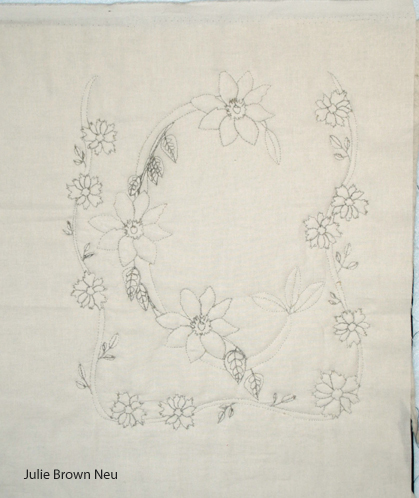 The drawn side was up and was not touching the fabric, but this looks like I quilted with gray thread and I did not. The thread was white when I started. So, lesson learned. I’m now boning up on how to use Tsukineko inks for the next step – coloring between the lines! I’ve only used the inks a tiny bit before so this is going to be some real Creative Play for me. I can’t wait!